This is the first of a series of posts about recent acquisitions by the Department of Early Books and Manuscripts in Houghton Library of classical material which reflect the continuing use of material that falls inside and outside the Department’s traditional chronological division (material before 1600) of the Library’s curatorial departments. 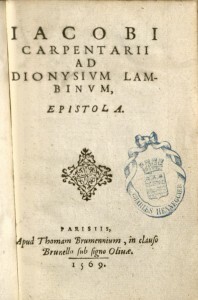 The first is Jacques Charpentier (1521-1574), Ad Dionysium Lambinvm Epistola, Paris: T. Brumen, 1569. 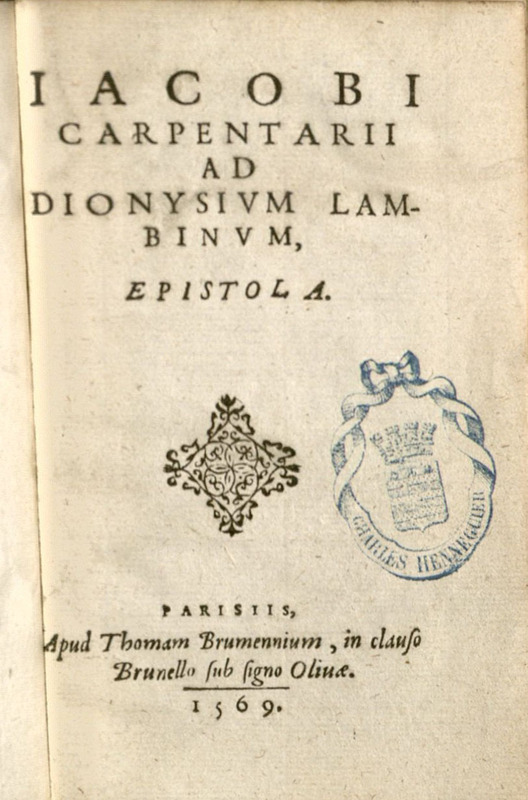 Charpentier was the professor of mathematics at the Collège Royale and in this public letter he accuses Denys Lambin, the professor of Greek at the Collège, of treason, Protestantism and dabbling in the Koran! These charges are based on his reading of Lambin’s edition of the works of the Roman historian, Cornelius Nepos, published earlier that year. Lambin was a pioneering editor of classical texts; his commentaries are now well respected for their wealth of illustration and for the inclusion of parallel passages from other sources, but clearly Carpentier felt he went too far and others have agreed. From his reputation his countrymen have coined the colloquial verb lambiner to wander from the point or to dawdle or bumble. This pamphlet was acquired from Bruce McKittrick Rare Books in Philadelphia, PA, with funds from the annual gift of David A. Goldberg, Class of 1954. Since 1981 Mr. Goldberg has given money each year to allow Houghton Library to bridge gaps in Houghton Library’s traditional areas of collecting. Not surprisingly one of the themes that arises out the books and manuscripts acquired with his gifts has been the enduring classical tradition.